We’ll be using two main techniques for studying weathering and erosion in the McMurdo Dry Valleys: acoustic emission monitoring (“listening to rocks crack,” as Missy puts it), and cosmogenic nuclide surface exposure dating. I’ll briefly explain the basics of both here. When a microcrack forms or expands in a boulder, it releases energy in the form of an elastic wave that travels through the rock. This phenomenon is known as an acoustic emission (AE). Acoustic emission events are similar to the seismic waves produced by earthquakes or nuclear explosions, but they operate at a much smaller scale; AE waves only travel about 1-2 meters before they are too small to be detected, whereas seismic waves can be recorded by seismographs all over the surface of the Earth. At the beginning of our field season, we will attach six acoustic emission sensors directly to the surface of four boulders, each with different weathering and/or erosional patterns. The AE sensors convert the elastic wave motion from very small cracking events to an electronic signal that we can then measure and record. With estimates of erosion on the order of 10 centimeters per million years (that’s only 1/100,000 of a centimeter every year!) in the McMurdo Dry Valleys, this type of instrumentation may be one of the only ways to observe rock breakdown in real-time. In addition to the acoustic emission sensors, we’ll install a meteorological station to record conditions near the boulders, including wind speed/direction, solar irradiance, air temperature, relative humidity, and air pressure. We’ll also place other sensors (thermocouples, surface moisture sensors) on the boulder surfaces. The hope is that we can compare the AE data to that of our meteorological station and other sensors to see if microcracks expand under specific environmental conditions—for example, after snowfall events, or during periods of fast temperature fluctuations. In summary, the AE data will tell us (1) what environmental processes or conditions lead to rock breakdown, and (2) how quickly it is occurring under the present-day climate. By placing six AE sensors on each boulder, we can also use 3D location software to pinpoint the location of each AE event (i.e., the “epicenter”) in the boulders with an accuracy of about 2-3 cm. 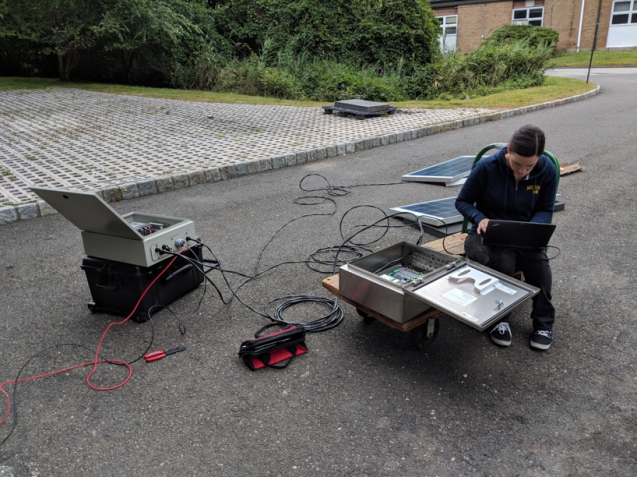 Missy has used this technique to monitor microcracking events on boulders in New Mexico and North Carolina, and we’re excited at the prospect of comparing datasets between these three very different climatic zones. While the acoustic emission system will help us to learn about present-day weathering and erosion, we’re also interested in how erosion rates have changed over time. These variations could be due to changes in the environment (e.g., temperature, precipitation, etc. ), or modifications of the rocks themselves. Some forms of weathering are negative feedback processes: for example, sandstone boulders may develop a “crust” over time that actually helps protect the underlying rock from further weathering and erosion. In these types of rocks, we may see a reduction in the average erosion rate as the exposure age—the duration of time the rock has been exposed to weathering and erosional processes—of the samples increase. In order to constrain longer term erosion rates, we’ll use a technique known as cosmogenic nuclide surface exposure dating. Cosmogenic nuclides (CNs) are rare isotopes that are created when cosmic rays—high energy particles from outer space—interact with atoms in the atmosphere and upper 1-2 meters of Earth’s surface. The longer a rock is exposed to this constant cosmic ray bombardment, the more CNs it will accumulate. If we have an estimate of how quickly these isotopes are created (which thankfully we do) and measure their concentration in a rock sample, we can then calculate that rock’s surface exposure age, or how long it has been sitting at the surface of the Earth. Because glacier ice blocks cosmic rays from reaching the underlying rock, the concentration of CNs in samples from formerly glaciated areas (e.g., parts of Antarctica or Greenland) is often used to infer the size and retreat history of past ice sheets and mountain glaciers. Importantly for our project, the concentration of a cosmogenic nuclide is dependent not only on the amount of time the rock sample has been exposed to cosmic rays, but also on the rock’s erosion rate: over time, erosion leads to a loss of rock material and hence, a loss of CNs. I won’t dive into the details here, but we have a couple of ways to use CNs to estimate rock erosion rates. In old landscapes, like parts of the McMurdo Dry Valleys, we can measure the concentration of a single cosmogenic nuclide with a half-life to estimate the exposure age of the sample. Alternatively, we can determine both the exposure age and erosion rate for a rock sample by measuring the concentrations of two CNs with different half-lives. 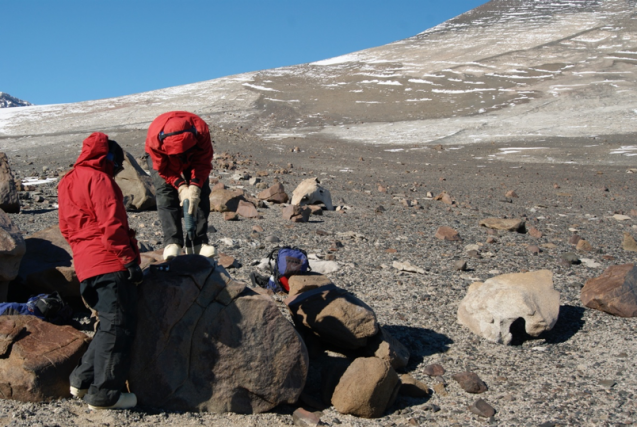 Our plan is to collect 60-70 rock samples over the entire length of Mullins Glacier. These rock samples will vary in the length of time they’ve been exposed on the valley floor (~0 years to 106 years), in lithology (dolerite vs. sandstone), and in texture (grain or crystal size). The samples will travel from McMurdo Station via a ship to California, then overland to the Lamont-Doherty Earth Observatory, where we’ll spend a few months purifying mineral separates, and preparing samples for mass spectrometry analyses. We’ll also send portions of the rock samples to Missy at UNC-Charlotte, where she’ll examine thin sections as well as the mechanical and thermal properties of the samples to determine how the rocks change internally over time. Beyond providing us with a lot of currently unknown information about how rock breakdown progresses in this extreme environment, the resulting data will offer other Antarctic scientists better estimates of erosion rates to use in cosmogenic nuclide surface exposure studies of ice sheet and glacier fluctuations on the continent.